Manchester United's caretaker manager Ole Gunnar Solskjaer has paid tribute to midfielder Paul Pogba following the club's 3-1 Premier League win over Huddersfield Town on Boxing Day. The France international found himself out of reckoning during the final stages of Jose Mourinho's managerial reign with the club but he has managed to reclaim his position under Solskjaer with key contributions against Cardiff and Huddersfield. Speaking after the Terriers game, Solskjaer was pleased with the efforts of the former Juventus man, who has contributed two goals and two assists in the past two matches for the club. "It was great to see him score two goals and he has created the goals last week at Cardiff, and now he scores them himself, so he will be even better for getting two lots of 90 minutes now," he told MUTV. 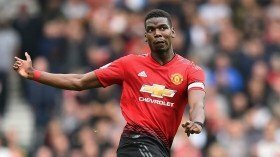 Pogba has endured a difficult campaign by his standards this campaign but he has still registered seven goals and six assists for United across all competitions.